The Centers for Medicare and Medicaid Services (CMS) has once again graced us with its forecasts for national health expenditures. The forecast is summarized in a Health Affairs article: National Health Expenditure Projections, 2012–22: Slow Growth Until Coverage Expands And Economy Improves (free download). 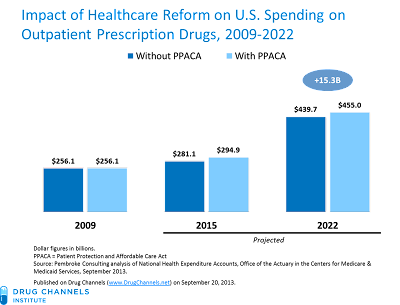 Prescription drug spending growth, which was negative in 2012, is projected to accelerate to 5.2% in 2014. From 2012 to 2022, annual expenditures will grow by $194.2 billion (+75%), to $455.0 billion. During this period, Outpatient prescription drugs will be at about 9% of total U.S. healthcare spending. Health care reform will add an extra $15.3 billion in annual drug spending by 2022. This is far below last year’s projected incremental $25.9 billion in spending by 2021. In a future article, I’ll look at who will be paying for all of these drugs. In the meantime, pity the poor government economists tasked with forecasting healthcare spending. 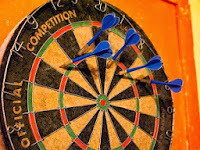 They must bravely peer beyond today’s pitched political battles and economic uncertainty—and then hurl a guess at the 2022 dartboard. Chin up, chaps! CMS’ economic boffins publish annual projections for U.S. National Health Expenditures (NHE), including prescription drugs sold through outpatient retail, mail, and specialty pharmacies. Expenditure (spending) data differ from that of pharmacy revenues, manufacturer sales, and provider purchases. NHE totals are net of manufacturer rebates, so the reported figures are lower than pharmacies’ prescription revenues. The data also do not measure *total* U.S. spending on prescription drugs, because these data exclude an indeterminate amount of inpatient spending on pharmaceuticals. Thus, U.S. drug spending is roughly equivalent to total outpatient pharmacy revenues minus manufacturer rebates. 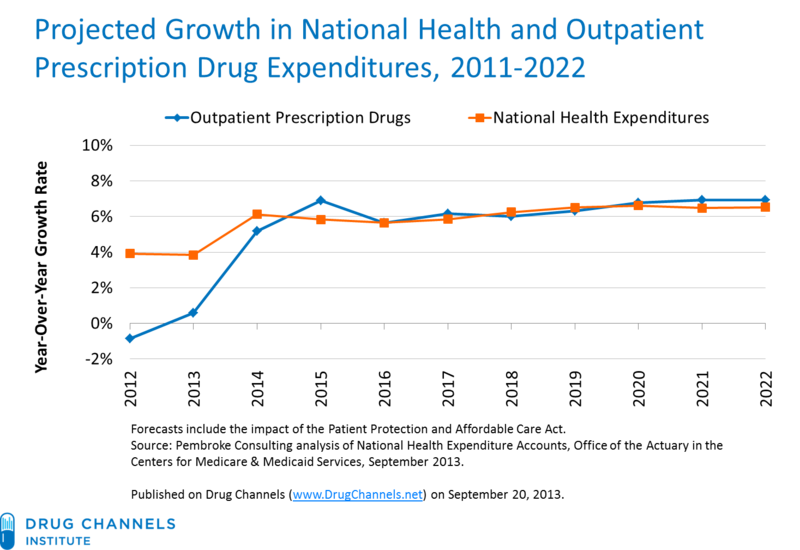 After 2014, CMS forecasts that drug spending will be comparable with the overall growth in national health expenditures. From 2012 through 2022, outpatient prescription drugs will remain at about 9% of total U.S. healthcare spending. CMS projects outpatient prescription drug spending will grow at a compound average rate of 6.5% from 2014 to 2022. During this period, there will be fewer generic launches and new, more expensive specialty drugs. CMS projects that the generic dispensing rate will plateau at 85%, which is slightly below other forecasts. The aging of the U.S. population will also boost prescription utilization. From 2012 to 2022, annual expenditures will grow by $194.2 billion (+75%), to $455.0 billion. Retail drug spending is projected to be $15.3 billion (+3.5%) higher in 2022 than it would have been without the PPACA. This new forecast is substantially lower than last year's previous projection of $25.9 billion of incremental sending. 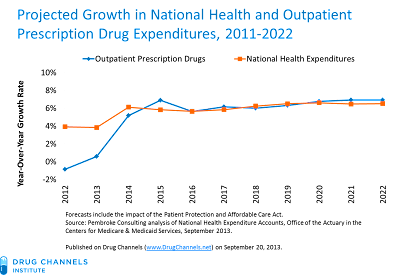 I discuss the June 2012 forecast in The Outlook for Drug Spending (With or Without ACA). If you live by the crystal ball, then you must be prepared to eat broken glass. Oh, well. Extra points for trying. Just don’t bet on a bullseye.